“Hobart College helped me believe in myself. The teachers were dedicated and they were always there if I needed help along the way,” said Emma recently after speaking at Hobart College Awards Evening for 2014 Achievers. Emma is a doctor with a passion for emergency medicine and the health of vulnerable populations. She graduated as Dux of Hobart College in 2001, gaining a scholarship to study medicine at the University of Tasmania. She graduated with a Bachelor of Medicine and Surgery with Honours in 2007. Since then she has been working as a doctor in Hobart and interstate, especially enjoying her time in the remote Northern Territory. 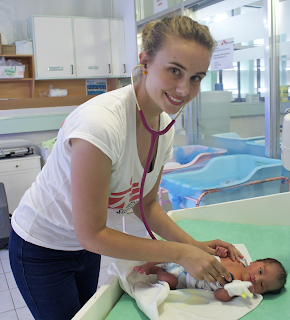 More recently she has taken on overseas assignments with Médecins Sans Frontiéres (Doctors without Borders). She went to The Philippines to help with the response to Typhoon Haiyan in 2013. Last year she worked in a violence stricken town in rural Pakistan. In both locations she ran an emergency department and a unit for unwell newborn babies. Alongside her work she has been studying for a Master of Public Health and Tropical Medicine and taking some time out to travel with friends. This year she is pleased to have returned to Hobart and is continuing her training in Emergency Medicine. And if Emma isn’t working, you’ll find her deep sea diving with turtles, bushwalking or camping with friends or travelling to remote islands to enjoy lying in the sun. You might see her in some local advertisements on television and recently her face was painted on the side of one of our local buses! For more information about studying at Hobart College, visit their website and Facebook page.